By Popular Demand, the New Store! RUSH: I need to remind you that we’ve upgraded the EIB Store, the RushLimbaugh.com store and our website. It’s all new stuff, top quality. By the way, we have been moving inventory at the most rapid rate in the history of the store this week. I mean, it is so gratifying. I wanted to remind everybody that we’re offering sort of like an inaugural week here. The store’s not new, but it is, because it’s restocked with brand-new stuff that is of the highest quality at the price point that we are offering. Well, you are. You’re blowing the doors down. And it is as gratifying as can be because we have stuff in there — and I don’t want to sound denigrating of the previous efforts here. But stuff that we’ve got, it’s a serious upgrade over what it was. For example, I’m just gonna tell you one thing, and it frustrated the heck out of me. I liked a particular kind of golf shirt. I’m not gonna mention the brand name. It doesn’t matter; could be any of them. So we went to this manufacturer and said, “We would really would love to stock this in the store.” “Well, that particular model you can’t because we can’t guarantee it’s always gonna be in stock.” I said, “What?” “No, you can’t advertise that because what if we decide to stop making it three months from now?” So we had to go with generic stuff that they were never gonna discontinue. Well, there was nothing special about it and it had no pizzazz in it. So it was just kind of your basic white-and-black golf polo shirts that was not stuff I get excited about, because we couldn’t find ways to work around limitations. But we found all different people now, and we were able to pick things that I wanted and the people we’re working with guaranteed us supply and stock of a sufficient quantity. I mean, nobody can guarantee they’re gonna make everything in perpetuity, but it’s a much better arrangement with practically everything that we have now in the restocking of the EIB Store. I want to remind you that it’s all popular demand. I mean, it was sitting out there languishing for years, and the people would come up to me now and then: “When are you gonna modernize this?” And I would say, “Come on. In the big scheme of things, it doesn’t matter. It’s just there as a service…” “You gotta get serious about it.” So finally, we did, and it’s brand-new. Kathryn designed the thing, the website and the web store, and she worked almost exclusively with the manufacturers and suppliers of the stuff we’ve got. It’s an ongoing relationship with all these manufacturers we have, and it’s only gonna bet better as we learn, as the operation goes on. But the big thing here is that there’s free shipping on whatever you buy here during our inaugural week through the end of business tomorrow, on June the 14th. RUSH: Folks, remember every purchase leads to a donation, a portion of it, to the Marine Corps-Law Enforcement Foundation, in the new EIB Store. And again, free shipping today and tomorrow only, as we inaugurate the new store this week at RushLimbaugh.com. RUSH: Folks, remember every purchase leads to a donation, a portion of it to the Marine Corps-Law Enforcement Foundation, the new EIB Store. 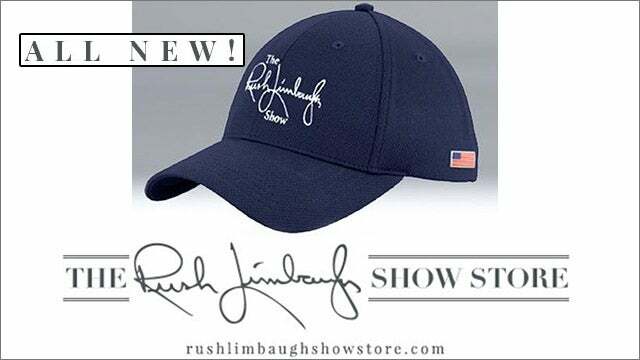 And again, free shipping today and tomorrow only, as we inaugurate the new store this week at RushLimbaugh.com.